Every fifth respondent plans to purchase furniture by the end of 2017. Those plans are correlated to household income: while in the group of the respondents with up to PLN 1,000 net per capita income (20%) one in five contemplates buying furniture, among the most well-off that figure is 26%, as demonstrated by a survey conducted on a representative sample of Poles in September 2016 for the purposes of PMR's report "Home furnishings and equipment retail market in Poland 2016”. 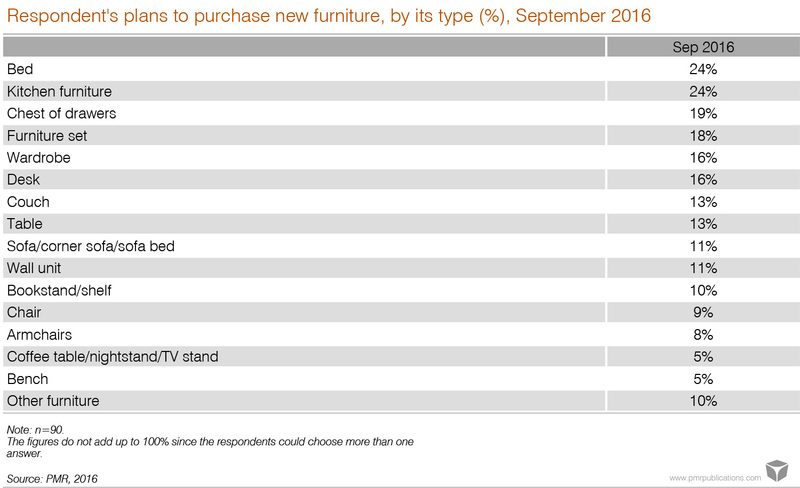 Among those stating that they will purchase furniture by the end of 2017, one in four intends to buy a bed and/or kitchen furniture (24% each). The purchase of a chest of drawers and a whole furniture set is considered by every fifth respondent in that group (respectively, 19% and 18%). Like in the previous edition of the survey, IKEA outlets are considered most often as the place to go when buying furniture (35%, or 11 p.p. up compared to the survey from 2015). One in four respondents contemplates a purchase at an Agata Meble (28%) or BRW (26%) store. A fifth of those reporting that they will buy furniture by the end of 2017, in turn, plan to purchase custom-made furniture from a carpenter (19%). Eight in ten respondents contemplating furniture purchase by the end of 2017 stated that they would be ready to pay more for better-quality furniture (79%). A somewhat smaller share expect professional advice from the seller (76%) and are inclined to go several kilometres further just to find a suitable piece of furniture. That motivation is in line with statements made by all the respondents as regards furniture selection – those reveal that for Poles the key factors in the process of furniture selection are its quality, durability (including resistance to damage) and functionality (respectively, 70% and 67%).